Casa Ana Milena is an old renovated semi-detached stone house situated in the small village Zbandaj approximately 7 km from Porec. The house is built in traditional Istrian stone building style and partially renovated. Casa Ana Milena offers to its guests the following outdoor services: garden area, private swimming pool with sun beds, barbecue, an annex (small summer house) with fireplace, table and chairs for outdoor dining and a parking space for three cars. 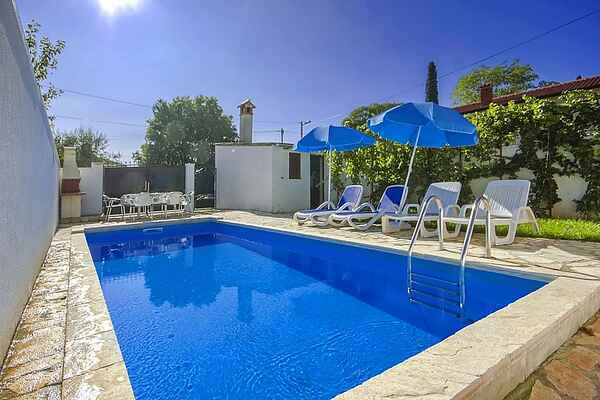 This holiday house is for 4-5 persons on two floors with a total living area of 80 m2. At the ground floor there is a fully equipped kitchen with dining table, living room with satellite TV and one person’s sleeping sofa, one shower/toilet. On the first floor there are two double bedrooms, one with double bed and one with two single beds.